Its becoming a challenge to cook for my son. He is such a picky eater. But he loves chicken… in any form 🙂 So I wanted to try a curry with soya chunks… after all its a vegetarian chicken 🙂 That is what we used call when we were young. Using soya chunks is very easy and no fuss process and tasty to eat. Boil a glass of water, add salt and soya chunks. Bring it to a boil once, turn off heat and drain the water. Squeeze the soya if you think there is more water. Keep aside. If you are not in a hurry, you can soak them in warm water with salt for 30 to 40 min and then squeeze them. Take a deep pan, and add oil. Once hot, add urad dal, mustard seeds and jeera. After the mustard seeds splutter, add curry leaves, green chillies, onions and turmeric. Fry for a min and add ginger garlic paste. Fry till the raw smell disappears. Add potatoes, soya chunks, salt, garam masala and kitchen king. Mix well and cover and cook for 10 min, or till done. Adjust salt and add a handful of chopped coriander. Serve hot with rotis or steamed rice. 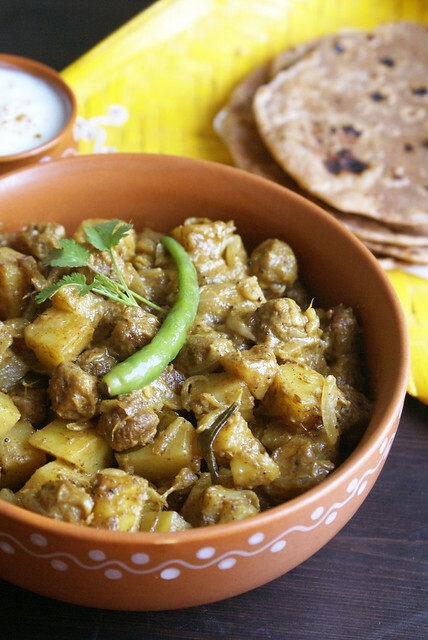 You can even omit potatoes and make it using only soya chunks. In the end if you feel the curry too dry, you can add 2 or 3 Tbsps of milk or cream. If you don’t have Kitchen King masala, you can add chicken masala. I omitted red chilli powder as I was cooking for my son. If you want it spicy, add a tsp of chilli powder while adding garam masala. My kid loved it, so I can say that it will be a sure hit if you want to try something new with your kids. Sending it to the event Subzis for Rotis being hosted at Tickling Palates. I am not a huge fan of soya but this dish looks super delicious. This recipe is delicious! Thanks for sharing. First time here, You have a nice recipe collection. This recipe is delicious. I've never tried soya chunks, but judging by your photos, they look delicious! Good to see you back Spandana..nice looking bowl! My feeds showed Cinnamon trail but when I clicked , a new refreshing site welcomed me..Good to see you ..and this subzi looks so delicious..hugs and smiles..
@Finla U must try it..
@Uma Glad u like it. Great combination! Looks and sounds delicious. Nice photography… is it SLR Camera or what??? Thanks Rekha.. yes.. mine is a very basic old Sony SLR cam.. This is my hubby’s Favorite dish.